With the popularity of ArcGIS Online, there has been a steady rise in the number of people who use their Canadian data in a web map that utilizes one of the default basemaps available. Using webmaps for data visualization is great but quite often, people are not applying the correct (or any) datum transformation method. Eliminating this important step can lead to problems with data not lining up properly against the ArcGIS Online basemaps. Read more about which datum transformation method to choose and how to apply it in the first part of this series. Conversations regarding projections, coordinate systems and datum transformations can get complex. Don’t believe me? Have a look at the 200-page book Esri has available that helps people line up their data. It’s easy to dive too shallow into the topic and leave people confused or dive too deep and leave people with a glazed look in their eyes. You are probably thinking: if this is such a complex topic, why are you trying to distill it into a 500 750 (hey, I tried) word blog post? Excellent question! The reason is that with the popularity of ArcGIS Online, people increasingly want to showcase their Canadian data in a web map that utilizes one of the default basemaps available. Unfortunately, most people are not applying the correct (or any) datum transformation method required to consume their data in ArcGIS Online effectively. As a result, data ends up not lining up properly against the ArcGIS Online basemaps. Let me elaborate further. The projection in ArcGIS Online is set by the basemap you are using. If you are using one of the default basemaps, the projection is WGS 84 Web Mercator Auxiliary Sphere. Likely, the Canadian data you are working with is not projected in WGS 84 Web Mercator Auxiliary Sphere (more on that later). If that is the case, you’ll need to have a few settings in place before publishing the data; otherwise, you’ll have a misalignment of 1-2 metres depending on where you are in Canada (this difference will be visible at a scale of 1:2000 and better). After reviewing the information in this post, you will have the skills you need to make informed (and correct) decisions about your data, which should help you avoid any alignment issues down the line. First things first–let’s review the current datum for Canada. The current datum for North America is the North American Datum (NAD) 1983. The NAD 83 (Original) datum was created to address the inherent distortions in the previous datum (NAD 1927) and to adopt a geo-centric spheroid (GRS80) instead of one biased towards North America (Clarke 1866). Later, Canada created the Canadian Spatial Reference System, which is an improved 3D realization of the original NAD 1983 datum. This is what we now refer to as NAD 83 CSRS. Most geographic data currently captured in Canada is in NAD 1983 CSRS. You should be able to confirm the projection of your data by checking the layer properties in either ArcMap or ArcGIS Pro; however, if you’re lost, contact our wonderfully helpful Technical Support team, and they should be able to steer you in the right direction. The layer properties will indicate the projection of your data. The remainder of this article assumes that your data is in NAD 83 CSRS. If your data is in NAD 83 Original, I hate to break it to you, but datum transformations are likely going to be a bit more complicated. Check out the second part of this series of posts (to appear later in the month) on how to handle this scenario or drop me a line in the comments section and I’ll help you out. Assuming your data is in NAD 1983 CSRS, in order to have your data line up with the default basemaps in ArcGIS Online, you need to set the proper datum transformation method in your map. The transformation we should be using here in Canada is a seven-parameter coordinate frame transformation as shown. In ArcGIS, this transformation method is defined as NAD_1983_CSRS_To_WGS_1984_2. The seven-parameter coordinate frame transformation used in Canada to transform data between NAD 83 CSRS and WGS 84. Set the appropriate datum transformation method in your map prior to publishing. If you follow the steps explained above, publishing your service and consuming your data in ArcGIS Online should not result in any datum misalignment issues while overlaying your data against a default basemap. A 1-metre misalignment is visible between the published feature service and the basemap. No datum transformation was applied during publishing. There is no misalignment between the published feature service and the basemap. The correct datum transformation method was applied in the map prior to publishing. 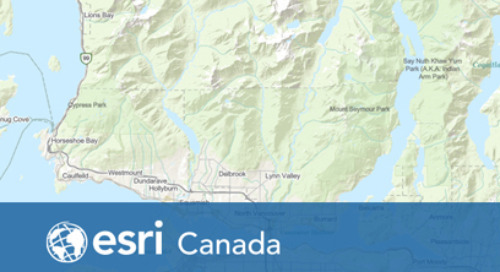 One quick note–if you notice a misalignment issue between your data and the default ArcGIS Online basemaps despite following the steps explained above, please let us know by leaving a comment in the Community Map of Canada Feedback tool. Although we strive to be perfect here at Esri Canada, there could be a mistake on our end. We will be only too happy to fix the issue as soon as possible. I hope this blog post about projections and datum transformation helps you become more confident in preparing your Canadian data and maps for publishing and use in ArcGIS Online. If you have any questions that haven’t been addressed here, please get in touch by posting in the comments section below. Sarah Sibbett is a senior cadastral mapping consultant with Esri Canada’s Professional Services team. Her focus is on parcel mapping projects across Canada, where she works with clients to increase their productivity and efficiency with the Parcel Editor solution. Sarah has built a reputation for being a creative thinker with a skill for problem solving. She began her career in Esri Canada as a summer student 10 years ago and has served as a mentor for the Associate GIS Professional Program, where she coached and provided constructive performance feedback to outstanding graduates selected for the program.